Dr. Kishor Suhatankar, who has been Associate Professor and Head of the Physics department , is appointed as the principal of Gogate Jogalekar College. He has earlier worked as in-charge principal of the college for last few months. Dr. Sukhatankar, in his immense experience of 35 years as a teacher in the department of physics of the college, has been awarded by the Mumbai University as the best teacher. He is also a recognized PhD guide of Mumbai University. 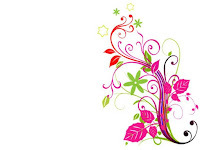 His research papers have been published in many renowned national and international journals. He has completed seven research projects aided with the funding agencies like UGC. 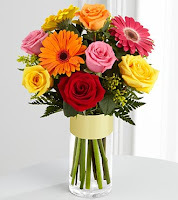 Earlier itself, he has contributed to the progress of the college with his experience and excellence as a teacher as well as the administrator. Now as well, he will surely take up the college to the highest glories under his powerful leadership. Hearty Congratulations Principal Dr. Sukhatankar sir !!!! of the Elocution and Debate Forum. The inauguration function of the Elocution and Debate Forum of our college took place on 3rd of July 2015 in the J.S.Kelkar Seminar hall. This year the inauguration function witnessed a different and healthy practice that of the organization of elocution and debate competitions at the start of the forum itself. Dr. Chitra Goswami, Vice Principal( Arts), Prof. Uday Bodas, convener, Students’ Activities Cell, Dr. Yasmeen Awote, Head, Cultural Department , being the guests for the programme, were welcomed by Prof. Jayant Abhyankar, convener of the forum. Prof. Abhyankar in his speech introduced the students present to the objectives and activities of the forum. Dr. Goswami, Prof. Bodas and Dr. Awote expressed their wishes to the members of the forum. On 3rd July , the club organized an elocution competition on the topic ‘Importance of Art in human life.’ The participants were judged by Prof. Shivaji Ukarnde and Prof. Madhura Athavale. A debate competition on the topic ‘World Yoga Day will lead to commercialization of Yoga’ was organized the very next day, and the judges for this competition were Dr. Atul Pitre and Prof. Shrivallabh Sathe. All the judges gave very valuable guidance to the participants regarding their content and style. 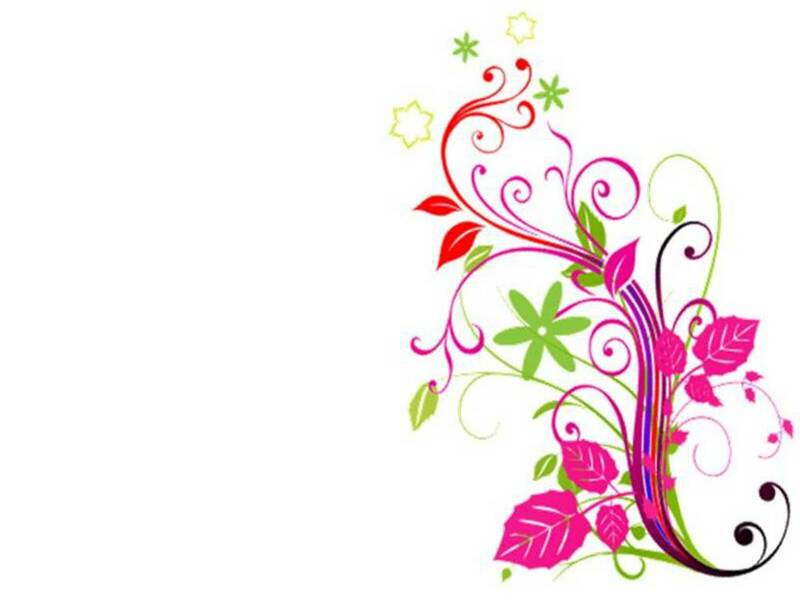 It was decided that the forum will give an additional opportunity to the participants and the second round of both the competitions will take place on 16th July in the Seminar Hall. The students competent to participate in the elocution and debate competitions in the youth festival of Mumbai University will be selected from this round. 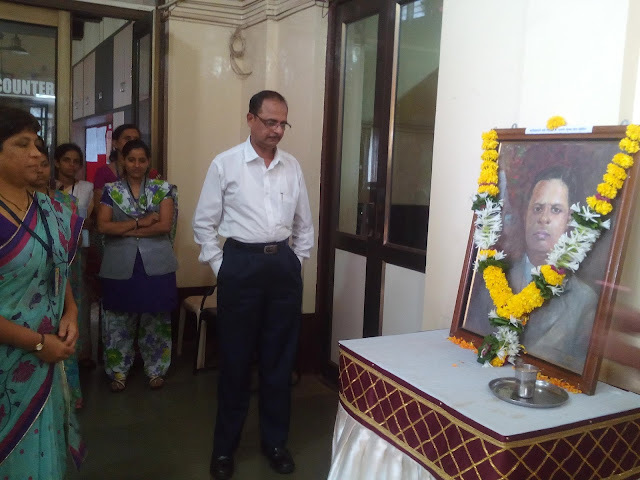 Principal, Dr. Sukhatankar paying homage to Late Nanasaheb Gogate, the first donor of the college. 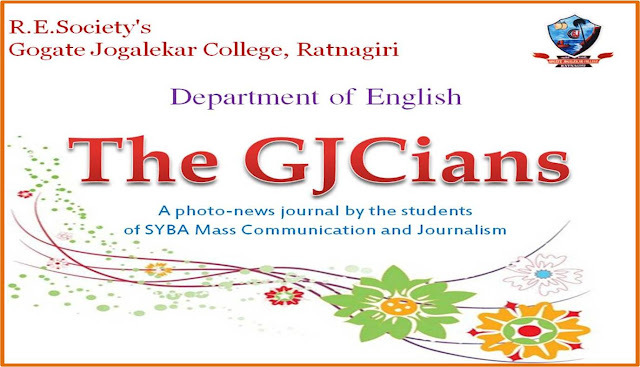 In the memory of late Narayan Raghunath Gogate, Gogate-Jogalekar College observed his death anniversary on 8th July, 2015. The programme took place at 8.30 am in the corridor next to the principle’s cabin. Dr. Kishor Sukhtankar, Principal of our college offered floral homage to the portrait of the maiden donor of the college, Late N. R. Gogate, also called as Nanasaheb Gogate. 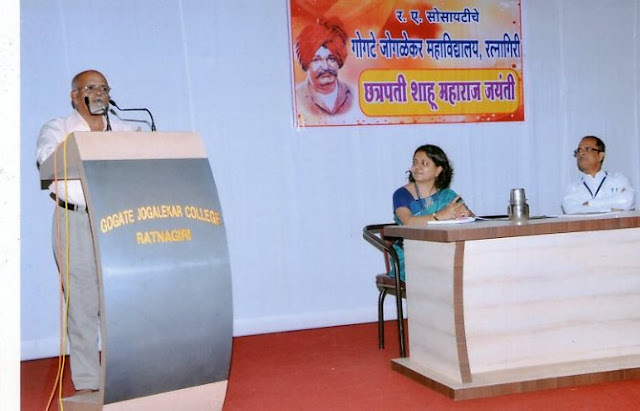 Dr. Sukhatankar, in his address enlightened all the people present about the valuable donation given by Nanasaheb in the establishment of the college. “ As we find reference in the name of the college ‘R. P. Gogate College of Arts and Science’, in 1945, Nanasaheb donated huge amount to the college in the name of his father, late R. P. Gogate. His donation is an immense contribution in our college’s establishment and progress.”, said Dr. Sukhantankar. The teaching and non teaching staff members of the college were present on the occasion. The programme was anchored by Prof. Seema Kadam, who also extended vote of thanks, in the end, to Dr. Sukhatankar and all the staff members present. 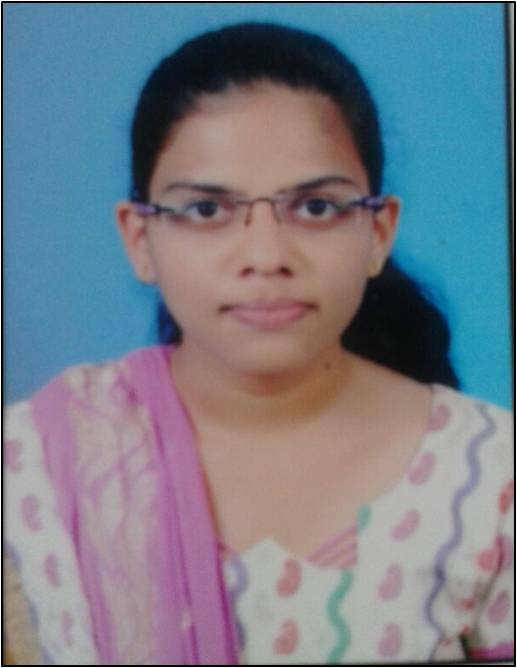 Student of Gogate-Jogalekar College Miss Ayushi Nandakishor Manik has successfully passed ‘Max Mueller German A -1 Certificate exam’ scoring 80%. She studied for this exam in the classes organized by the Bartakke Institute of R.E.Society. The exam included proficiency in listening, reading, writing and speaking. So, Herzlich Gratuliere (hearty congratulations) to her and all the best for her bright future. दिनांक २६ जुलै रोजी गोगटेजोगळेकर महाविद्यालयामध्ये छत्रपती शाहू महाराज जयंती निमित्ताने 'सामाजिक परिवर्तनाचे अग्रदूत शाहू महाराज' या विषयावरील व्याख्यानाचे आयोजन करण्यात आले होते. राधाबाई शेट्ये सभागृहात आयोजित करण्यात आलेल्या या कार्यक्रमात व्याख्याते म्हणून दैनिक सागर चे संपादक , जेष्ठ पत्रकार श्री. भालचंद्र दिवाडकर यांची उपस्थिती लाभली, सामाजिक सुधारणा आणि परिवर्तनाच्या कार्यात शाहू महाराजांचे बहुमोल योगदान श्री. दिवाडकर यांनी इतिहासातील महत्वाचे संदर्भ स्पष्ट करत उलगडून दाखविले. कार्यक्रमाचे अध्यक्षस्थान महाविद्यालाचे प्राचार्य डॉ. किशोर सुखटणकर यांनी भूषविले. कला शाखेच्या उपप्राचार्य डॉ. चित्र गोस्वामी देखील या प्रसंगी व्यासपीठावर उपस्थित होत्या. डॉ. सुखटणकर यांनी अध्यक्षीय समारोपाच्या भाषणात शाहू महाराजांसारख्या थोर नेत्यांमुळे आज आपल्याला चांगले समाज जीवन लाभले आहे याची आपण सर्वानी जाणीव ठेवली पाहिजे आणि त्याकरता अशा समाज सुधारक नेतृत्तावाप्रती कृतज्ञ असले पाहिजे असे आवाहन सर्वांना केले. कार्यक्रमाचे प्रास्ताविक प्राध्यापिका सौ. कल्पना आठल्ये यांनी केले, तर सूत्रांचालन आणि आभार प्रदर्शन प्राध्यापक रामा सरतापे यांनी केले. कार्यक्रमाला महाविद्यालयातील प्राध्यापक आणि विद्यार्थी मोठ्या संख्येने उपस्थित होते. In the first week of July the newly admitted First Year students of Arts, Commerce and Science faculties were addressed and guided by Principal Dr. Kishor Shukhatankar. Dr. Sukhatankar in a very friendly manner talked to the students enlightening them about the glorious history of the college and its vision and mission. It was followed by the introduction of various curricular , co-curricular and extra-curricular activities in the college by the concern convener of the activities. Dr. Sukhatankar and all the conveners of the various activities in the college introduced students the the wide range of opportunities available in the college and encouraged them to utilize the opportunities for their all round development.